The Best Cream Puff Cake recipe featuring a fluffy crust, easy vanilla filling, and of course, chocolate. 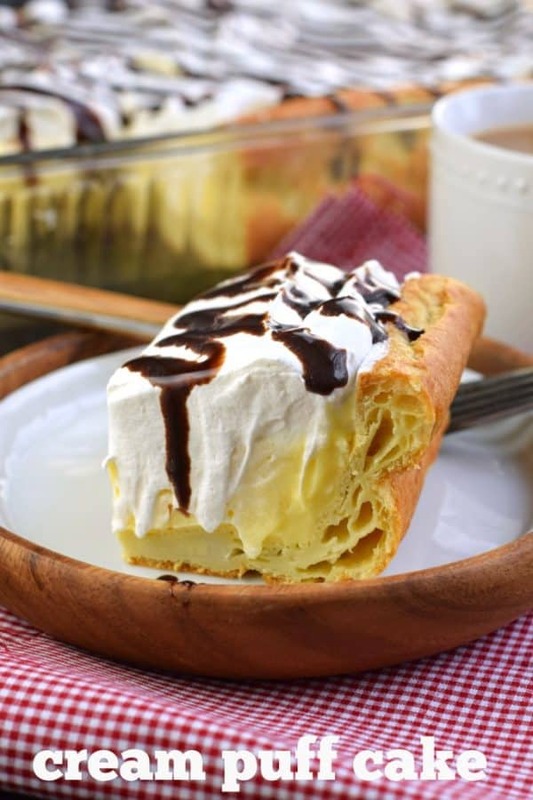 You’ll love this homemade version of a cream puff! If you’ve ever had the chance to enjoy a popular, delicious Cream Puff, then you know what I’m talking about when I say they are a delicious, indulgent treat. The texture of the pastry is slightly chewy but delicious. And it’s filled (traditionally) with a vanilla pastry cream. 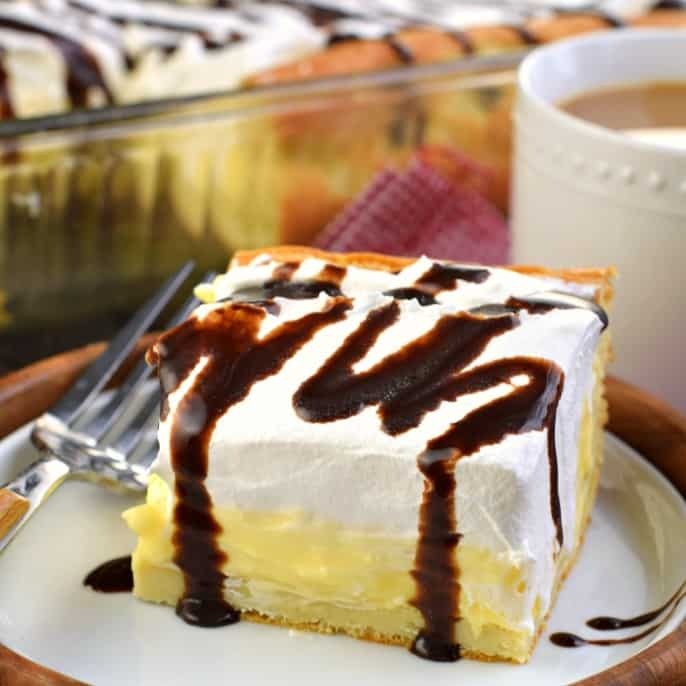 Today’s Cream Puff Cake recipe is an easy version of this traditional dessert, in a cake form that will feed a group! Start by making the puffy crust. You’ll need a 13×9 baking dish for today’s cake recipe. I sprayed mine with non-stick baking spray (but if you lightly grease and flour the pan that works too). In a small sauce, heat butter with water over medium high heat. Bring to a boil. Once boiling (and butter is melted), remove from heat. Whisk in flour and blend until it forms a ball. In a large mixing bowl, add the flour mixture. Beat in eggs, one at a time. Finally, beat in 1 tsp vanilla extract. Pour crust mixture into prepared baking dish. Spread evenly in pan and bake for 30 minutes. Don’t be alarmed when you pull it out of the oven and the sides are all puffed up. This is what is supposed to happen! Allow the crust to cool completely before adding the filling. For the filling, whisk together 2 small boxes of instant vanilla pudding mix (3.4 ounce packages) with 2 1/2 cups of milk. Blend in softened cream cheese and beat until fluffy (about 3-4 minutes). Pour into prepared, cooled crust. 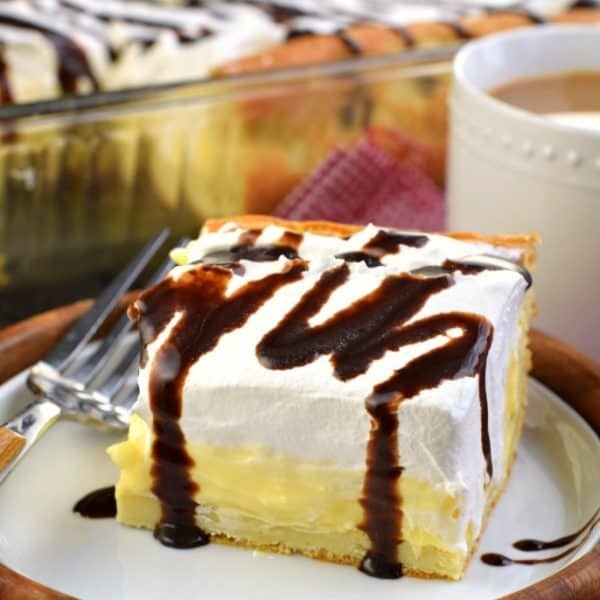 Top with homemade whipped cream or Cool Whip (whipped topping) and chill for at least one hour. Drizzle with chocolate syrup or top with chocolate chips before serving! ENJOY. 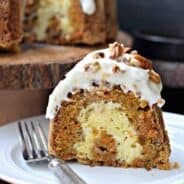 One of the things I love about this cake is you can make it a day or two in advance and it will still have the same texture and flavor as if you just prepared it! 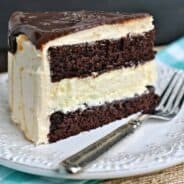 Traditional Chocolate Eclair Cake made with layers of graham cracker, pudding mix, and chocolate ganache. Easy no bake dessert! 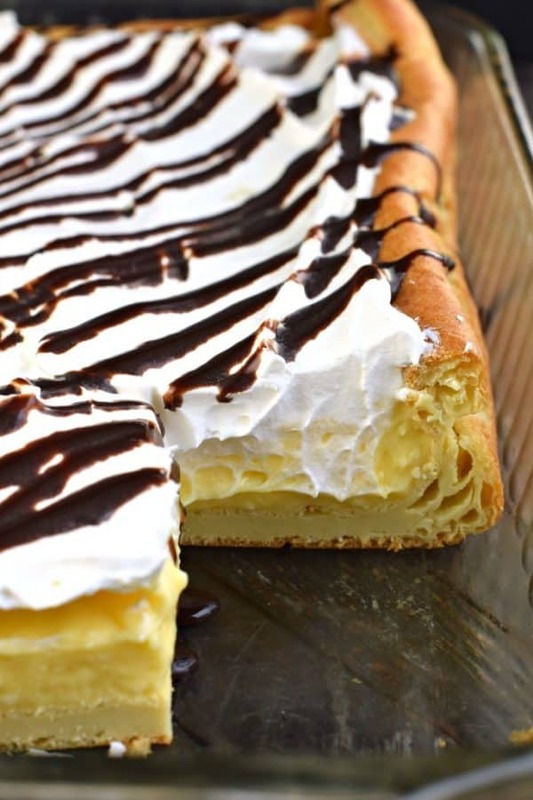 Layers of cinnamon graham crackers, vanilla pudding and fresh banana make this no bake Banana Eclair Cake a huge summer hit! To top it off, I literally topped it off with a cinnamon glaze! Easy, fried Boston Cream Donuts in under 30 minutes! Made using biscuits and filled with a creamy pudding mixture, these are sure to tempt you! Don’t forget the rich chocolate ganache! The Best Cream Puff Cake recipe featuring a fluffy crust, easy vanilla filling, and of course, chocolate. You'll love this homemade version of a cream puff! Preheat oven to 400 degrees F. Spray a 13x9 baking dish with baking spray. Set aside. In a small saucepan, add the butter and water. Bring to a boil over medium high heat. Remove from heat and whisk in flour. Pour flour mixture into a mixing bowl and add in eggs one at a time until well blended. Add vanilla extract. Spread into prepared baking dish. Bake for 30 minutes. In a mixing bowl, whisk together the pudding mix and milk until blended. Beat in softened cream cheese (for about 3-4 minutes). Pour into cooled crust. Top with cool whip. Drizzle with chocolate syrup. Refrigerate for at least one hour. ENJOY. What a great way to make cream puffs for a crowd! 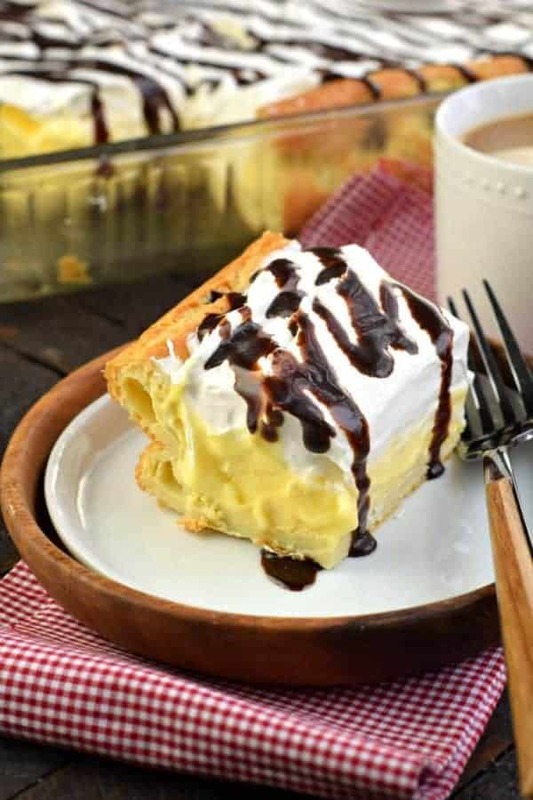 That puff pastry dough sounds amazing and drizzling some chocolate sauce and chocolate chips over the finished cream puff sounds like the perfect topper. I adore making cream puffs but have never made them in cake form. This is a recipe I can’t wait to try. It looks amazing!! This seems so much easier than make individual cream puffs. What a great idea for any large gathering! I cant wait to try my hand at it! Perfect way to make dessert for a party or get together! Looks amazing! This is like a dream come true! It’s beyond delicious. 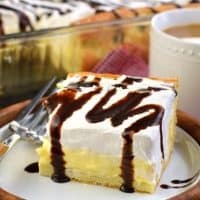 Definitely a party perfect dessert and so easy!! This recipe if perfect. Just printed it and can’t wait for company to try it out. We cant get enough of this cake. 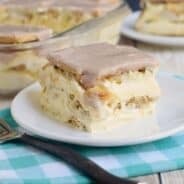 We have been making it for years and this recipe is amazing. Thank you so much for reminding me to make it again!